As earlier said I had plans to get out on a hike at least once a month this year. Unfortunately I didn’t get a chance to get out in April, and until the comming weekend I haven’t had a chance to get out in May either. I’m currently taking a hunters license and spend weekends on the shooting-range. That, and work every third weekend leaves me with a full schedule. This weekend though I’ll hike in Tresticklan nationalpark. The park borders Norway and Lindsneset nature reserve. It’s a 5,5 hour drive from home and I plan to leave early on Friday morning and get back home on Sunday. 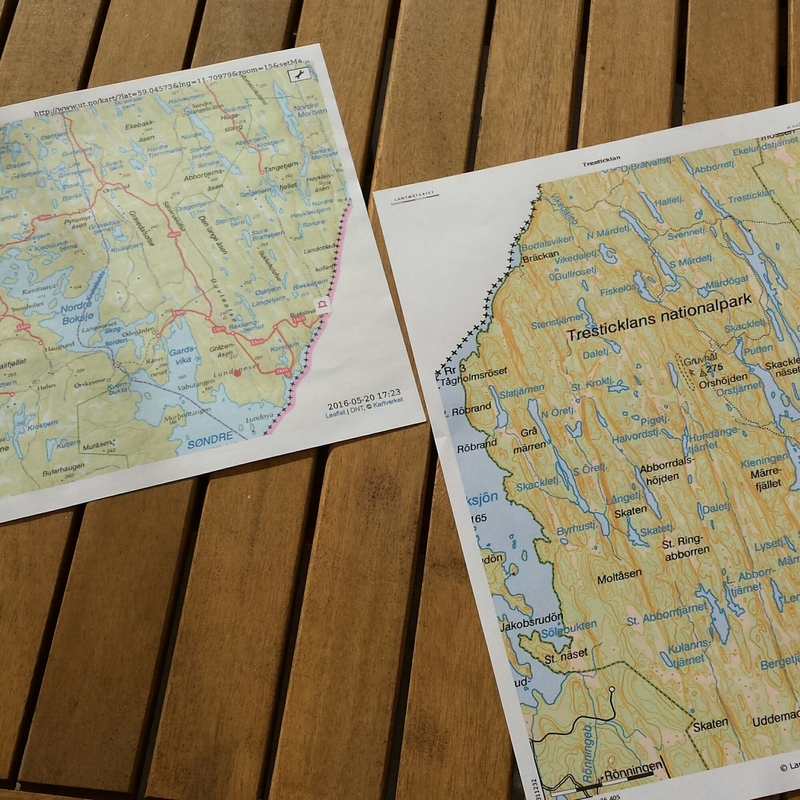 The initial plan was to meet up with a friend in Gothenburg and then drive together to Tresticklan. Unfortunately he discovered that he had a meeting planned on Friday and would join in the evening instead. My plan then was to drive to the southern entrance of the park and solo-hike during the day and then meet my friend at the main entrance. When I studied the detailed maps from Lantmäteriet, and asked in a forum, I discovered that there were gates on the roads since it’s not a public road all the way to the entrance. It’ll be a 4-5km walk from the gate to the park, on what’s supposed to be a really boring gravel road. My other option was to drive up on a small logging-road to the east of the park and then bushwhack through the forest into the park and to the trail. Then it’ll be about 1km walk from the road to the trail and probably in a more scenic environment. I’ve more or less decided to go with that option. Well, this was the plan so far but of course it changed. My friend and his girlfriend have been house hunting during the year. Yesterday they got an offer on a house they’ve been looking at, and it is likely that they’ll have to spend the coming weekend with things concerning what hopefully will soon be their house. So for now it’s a good chance that I’ll end up doing yet another solo hike. It’s a bit unfortunate, but even though I looked forward to seeing him and hike with him I don’t mind to much. I do like my solitude and hiking alone does have it’s benefits. Choosing your own pace, when and where to take a break, set up camp or leave in the morning. We’ll see how it ends up. Hopefully he’ll come, but if he don’t I’ll have a great hike anyway. All that’s left now is to plan the food and buy some snacks. I’m really looking forward to try my new Cumulus Quilt 350 since I haven’t used quilts before. I am also new to quilts. Although I have used my Cumulus Quilt 250 a couple of times now. I used it last weekend in Söderåsen and it was perfekt. I found that if the temps get below 5 degrees, which it did the first time I used it in the beginning of May this year, then I had to supplement with my puffy jacket. I’ll definitely be using my quilt all the way through to autumn. Good choice with the 350 as you will probably have cooler temps up where you are going. Yeah I was considering the Quilt 250 but I really hate being cold at night so I went with the warmer one. I look forward to trying it out tomorrow. I saw your Instagram-photos from Söderåsen. Seems like a great place for an overnight-trip. Is it crowded with people this time of year? It wasn’t too bad, although I think that it will not be an option for the next couple of months. I have trips planned for next month in Denmark so we’ll see how that goes.